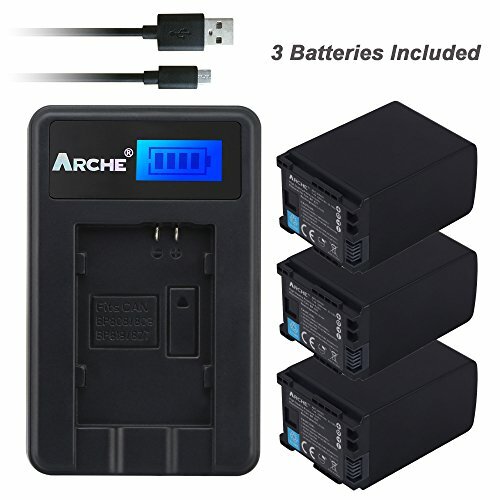 ✔ ARCHE rechargeable Lithium-ion battery replaces the battery for Canon BP-827 BP-808 BP-809 BP-819 ; Battery capacity ; 3200mAh ; voltage 7.4V; It is able to charge and discharge more than 500 times and excellent sustained lifespan. ✔ The kit include 3 pack high capacity rechargeable Li-ion battery cell and battery charger. ✔ CE certified, tested by manufacturer to match OEM products. Our purpose is to bring our customers with premium quality product. If you were not 100% satisfied with our product, contact our customer service and we will make every effort to meet your satisfaction. We would appreciate hearing your valuable advice on our products! [Long Battery Life] ARCHE rechargeable lithium-ion battery replaces the Canon Battery capacity: 3200mAh, voltage: 7.4V and 23.7Wh. Charger : 8.4V/0.8A ; It is able to charge and discharge more than 500 times and has excellent sustained lifespan. If you have any questions about this product by ARCHE, contact us by completing and submitting the form below. If you are looking for a specif part number, please include it with your message.